Teapot Mountain 茶壺山 is definitely one of my favorite hikes in all of Taiwan. On a clear day, Teapot can easily be conquered on a day trip from Taipei that even includes a visit to the nearby towns of Jinguashi 金瓜石 and Jiufen 九份. A full weekend away could include any of the beautiful scenic areas of the Northeast Coast, including the Bitou Cape, Fulong Beach, Pingxi, the nearby Keelung City, and many other nice spots. Banpingshan has amazing views of the whole Northeast Coast. The trail starts on the grounds of Jinguashi’s Gold Ecological Museuem. There’s no entrance fee to the museum’s grounds, just walk in the main gate and wind your way through to the other side (don’t worry, we always get lost in there too!) The museum has several exhibits, including a ride that goes through an old mining tunnel, and a very large piece gold. The hiking trail starts past the mine. 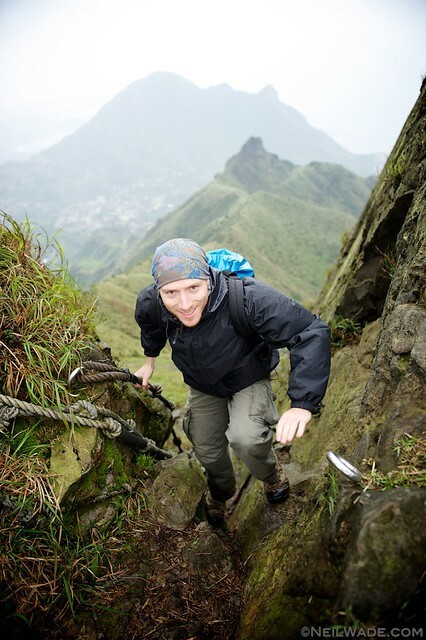 The Teapot Mountain Hiking Trail, like many others in Taiwan, starts off very steeply, and continues very steeply. There is a clear trail to the teapot (Yes, it really looks like a teapot! ), that is actually a dirt road for most of the way. There are also several pavilions to rest in and escape the sun if your here on a particularly hot day. My biggest surprise the first time I hiked Teapot, was that it really is like a teapot! You can (and have to, if you’re continuing on) climb right inside it. We even once found an area inside that has residue from the steaming sulfur deposits deep in the mountain… This means that at one time, there might have actually been steam coming out of the Teapot! Looking down on Jinguashi from inside Teapot Mountain. Teapot Mountain has amazing views of the whole Northeast Coast. Finding the way through Teapot Mountain can be a bit difficult at times! Many people stop at this point and head back to Jinguashi. But, there is an excellent trail that continues out the back of the teapot, and on up to Banpingshan 半平山. After figuring out how to climb through the teapot (it seems different every time to me). 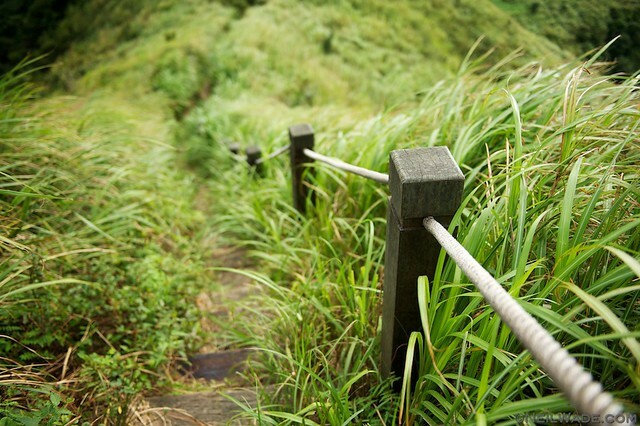 Follow the trail through the tall grass, straight towards the ridge. It can be a little difficult to follow at times, and you might want to bring long sleeves as to not get cut by the head-high grass. 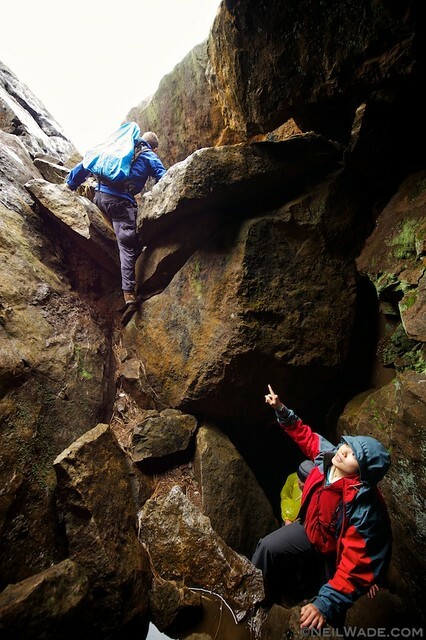 Once at the ridge, there is a cliff section that needs to be climbed. Don’t worry, it’s not a straight-vertical cliff, and there are very sturdy ropes there to help you, but it’s not for the faint of heart. The top of the Banpingshan Ridge offers even more stunning views than from Teapot. This is from the trail headed up to Banpingshan, looking back at Teapot Mountain. The mountains that love you back. 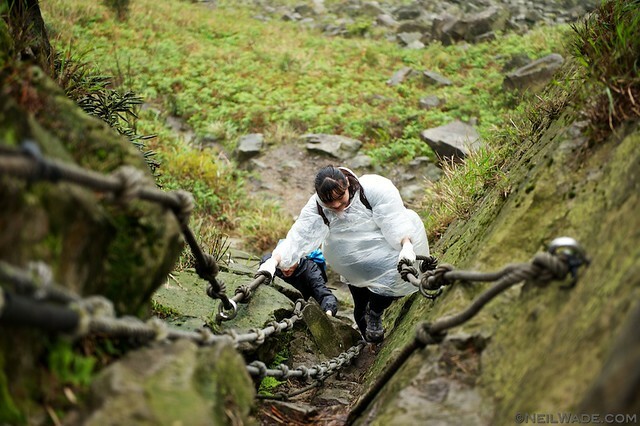 The ropes at the ridge line of Banpingshan are challenging, but doable, even in the rain. Ross at the top of the ropes at Banpingshan. Follow the ridge trail to the right until you come to a dirt access road. Follow that road to the right for several kilometers until you come to a main road (with cars driving on it). Walk across the parking lot there and you’ll find a trail that goes down behind it. When you reach the next road, make a left. Continue for a few minutes then make another left just before the graveyard to go through some windy back alleys to get to Jiufen Old Street (highly recommended), or you can eventually make a right to get back to Jinguashi (I’m not exactly sure where, though). Please take note that it’s easy to get lost in this area, so a smart phone with a map app comes in very handy. This circular route should take about 4 to 5 hours. Check out this map. 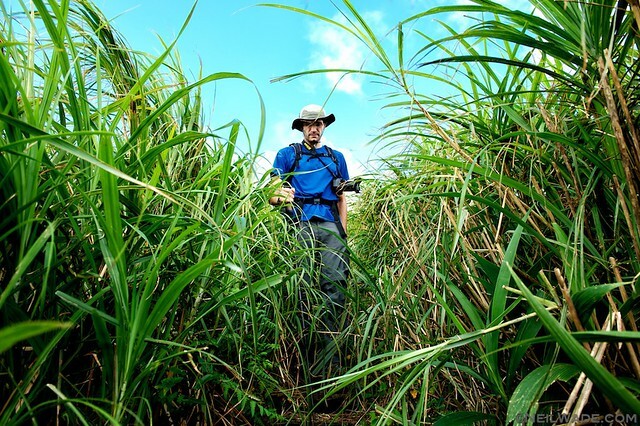 You might want to take a long sleeved shirt to protect your arms from the very tall silver grass. 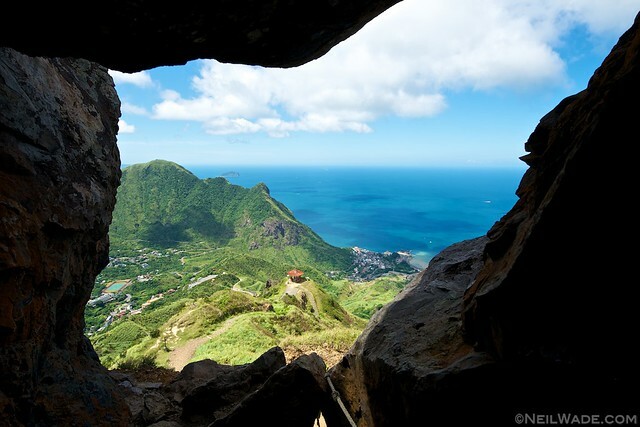 One warning for this hike: This trail is very exposed to the sun. There are very few trees. I don’t think I’d do it on a hot, summer day, but if you do, be sure to take lots of water, sunscreen, and sun protection. We usually take the train from Taipei Main Station to Ruifang 瑞芳. Across the street and to the left a block from the front of the Ruifang Station, is a bus stop with frequent buses to the Gold Ecological Museum, where Teapot Mountain starts. Buses also leave from various places around Taipei for Jiufen and Jinguashi, like the City Hall Bus Terminal, above the City Hall MRT Station. There really are lots and lots of things to see in this area. 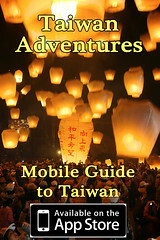 Check out Taiwan Adventures Online Guidebook for more information. 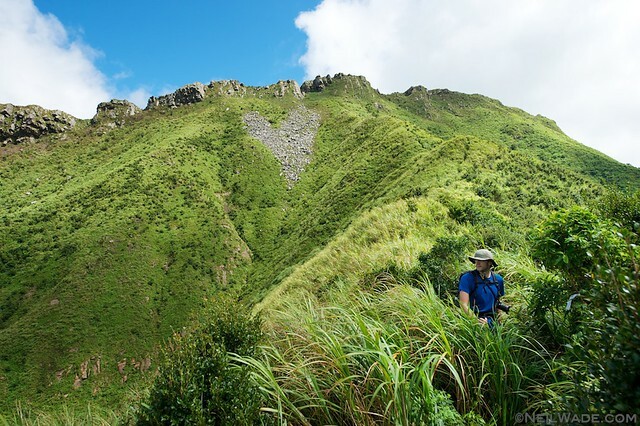 Or Join the Taiwan Adventures Group page on facebook and join us on the next day hike! THANK YOU SO MUCH for your posts, I’ve spent hours browsing through your posts, and climbed Elephant & Tiger Mts this week. 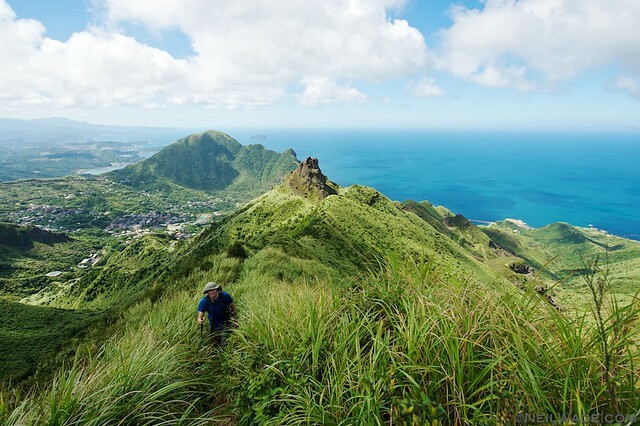 I’m Taiwanese-American myself, and never knew that Taiwan had such phenomenal hikes. I’m in Taipei until June 13th, anything planned for this weekend or next? Glad to hear it! It really is great up there. We don’t have anything planned next weekend, but you can keep up to date by joining our facebook group. Pingback: Spirited Away | To The East About Face! Hi, thanks, I enjoyed the read! Keep up the hard work! 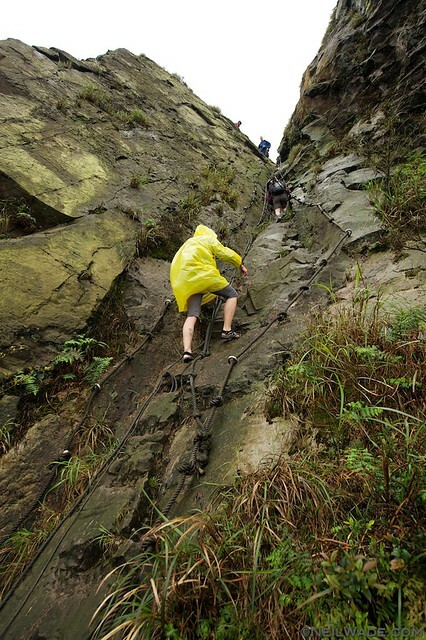 Hey for anyone who does this hike, if you go left instead of right after climbing up the ropes to Banpingshan, the trail will take you back to the coastal road. Took us 3.5 hours to get down and there’s lots of steep slipping and sliding. Not for the faint of heart. Thanks for the info! You’re right. That’s a lot of people’s favorite day hike in Taiwan. It’s called Stegosaurus Ridge and everyone should know that it’s: A. Awesome. B. A bit dangerous. C. Illegal because you have to trespass on posted “no trespassing” private property at the bottom. Hello, what month was this hike? 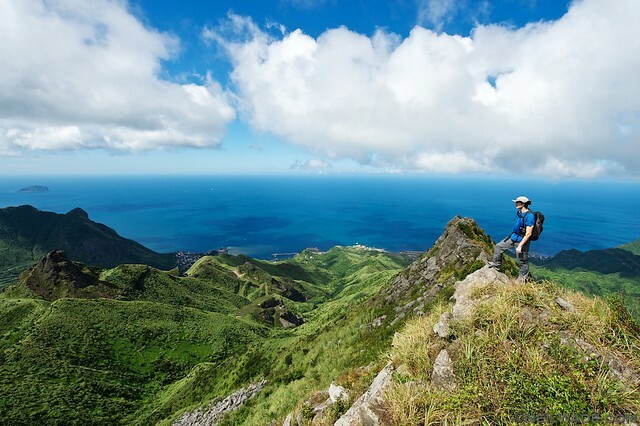 I have a question – would you recommend hiking in Taiwan in March/April or rather to postpone the trip to Autumn? 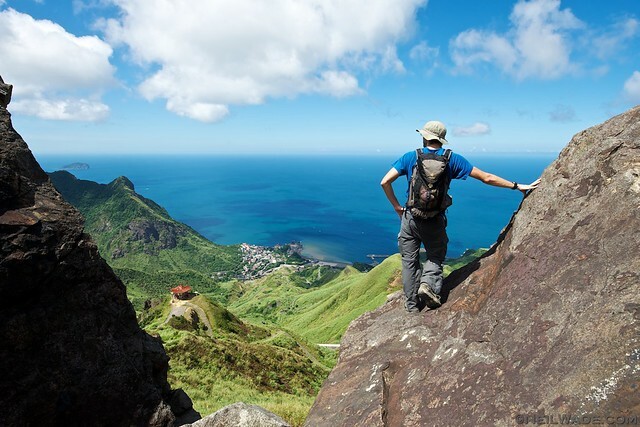 We want to come to Taiwan for period 23.03-13.04. and we want to focus mainly on hiking . We do not need to hike over 3000m, it can be low altitude treks e.g. at 2000 m.
It seems that weather is not very stable at this time, not sunny and that visibility is much worse than e.g. in Autumn. Is that right? Or maybe the difference in weather is not so significant to change plans? (coming in in Spring is much more convenient for us). In all honesty, the weather isn’t reliable at any time any more. This has been the wettest fall/early winter that I can remember, and it is supposed to be quite dry. I wouldn’t change your plans based on hoping for good weather.